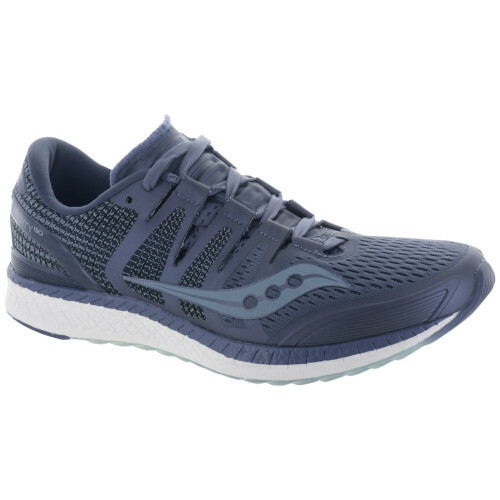 The Saucony Liberty offers us something that can be difficult to find in running shoes, speed and light stability. The Liberty takes Saucony’s popular Freedom, and adds a bit of stability by way of a small thermoplastic piece placed on the medial side. Like the Freedom, the Liberty features a full length Everun midsole, a feature which not only gives the shoe a bouncy and cushioned ride, but makes it more durable as well. This is only the second shoe that Saucony has put out that offers the material in the entire length of the sole. The full-length EVERUN midsole, which delivers uncompromising cushioning throughout the run, further supports the longevity of the shoe. While EVERUN is becoming increasingly common in Saucony shoes, the Freedom is the only shoe currently on the market that features a full-length EVERUN midsole. As such, the introduction of the Liberty and several other Saucony models with full-length EVERUN marks a larger shift towards this new, responsive feel. Both the Liberty and the Freedom also incorporate an EVERUN topsole that is laid over the midsole for additional cushioning as well as impact dispersion. To add more stability to the shoe, Saucony included several overlays along the sides of the upper and added structure to the support frame in the heel. The overlays are placed in conjunction with the stripped-down ISOFIT upper used for the Freedom, which offers a snug foot wrap with a rather roomy forefoot. The streamlined support frame generates a snug heel lock without a drastic increase in weight. In fact, even with the added support features, the Liberty is only 0.7 ounces heavier than the Freedom. The shoe features a 4mm drop and is a great option for a race/workout shoe or as a daily trainer for efficient runners who don’t like a lot of shoe underfoot. There are not a lot of shoes available in the lightweight moderate support category and the Liberty is sure to stand out in this under-saturated niche. Come on in and check out a pair today.